It is excess rather than gross money supply that generates upward pressure on asset prices or prices of goods and services in the economy. The result was summarized in a historical analysis of monetary policy, Monetary History of the United States 1867-1960, which Friedman coauthored with Anna Schwartz. The book attributed inflation to excess money supply generated by a central bank. It attributed deflationary spirals to the reverse effect of a failure of a central bank to support the money supply during a liquidity crunch. The monetary base is called high-powered because an increase in the monetary base (M0) can result in a much larger increase in the supply of bank money, an effect often referred to as the money multiplier. An increase of 1 billion currency units in the monetary base will allow (and often be correlated to) an increase of several billion units of “bank money”. This is often discussed in conjunction with fractional-reserve banking banking systems. 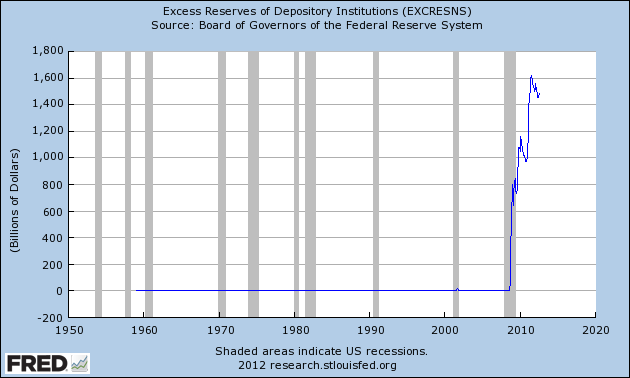 A system of full-reserve banking would not allow for an increase of currency in the banking system on top of the monetary base. So, out of 1,900 billion US-dollars of additional, sorry: excess money supply the banks have returned 1,500 billion US-dollars to the central bank, in effect shrugging their shoulders saying: we don’t want it. We don’t need it. It is often the case that the money stock is associated with the concept of money supply, but the truth is that we do not know whether the observable money stock reflects demand or supply. In fact, it likely reflects both if an equilibrium exists between demand and supply at all times. To facilitate the discussion below, we associate the observable money stock to “money supply” and focus on deriving a medium-term target for the money stock which we associate with “money demand”. In fact, it [the observable money stock] likely reflects both [demand and supply] if an equilibrium exists between demand and supply at all times. According to monetarist belief, banks would lend more if only they had more money. Demand, it is assumed, is always there. So, clearly the authors have abandoned monetarism, which is good (although a bite late, if you ask me). What I don’t get here is the second part about “if an equilibrium exists”. What would happen out of equilibrium? Are we supposed to be out of equilibrium? What if, say money demand is higher than supply? Does supply determine the equilibrium or demand? Coming from a monetarist background, it is very hard to understand today’s reality with the concepts of the past. 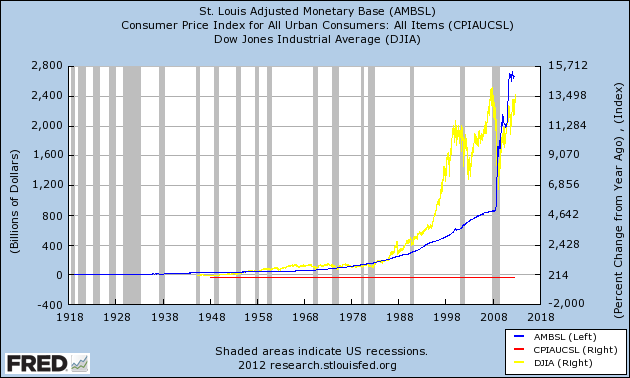 The monetary mechanism – from supply to demand – is completely upside down since at least 1971 and the end of the Bretton Woods System. It also is more of a credit than a money story, which focuses on loans, not on money. For those interested in a modern money perspective I recommend the MMT Primer.